The path has been taken so many times by now it’s a wonder it ever works at all. It’s about technique and its more than a little about feigning surprise. I think that might be why Patrick Wilson can do it so well. The best films about haunting do as little as possible. George C. Scott’s The Changeling has always been a standard from my point of view. Poltergeist was scary as hell, too. The first two Paranormal Activity films work as a significant change-up to the formula. 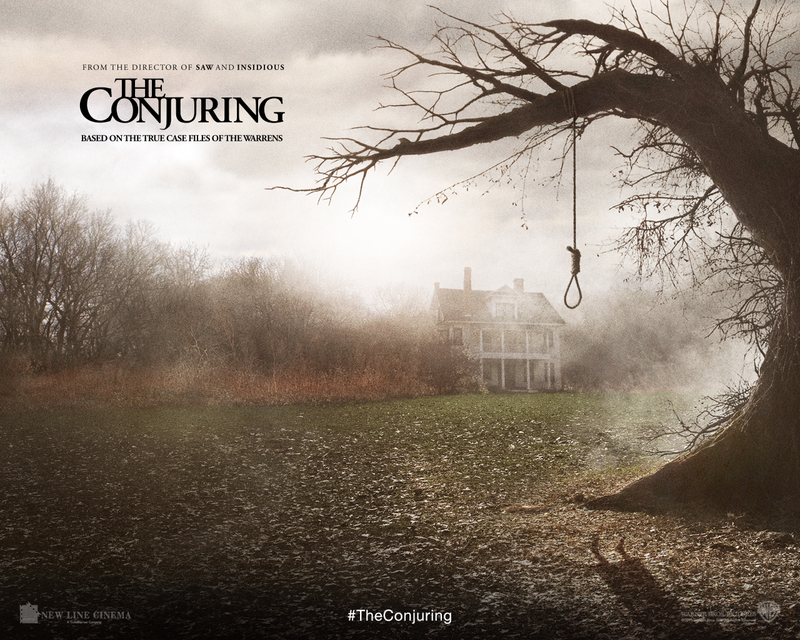 For those familiar with the name, The Conjuring is another case of the Ed and Lorraine Warren. They’ve been featured in such work as The Amityville Horror, A Haunting in Connecticut and countless television specials. It is their formula that we see in the paranormal investigator shows. Heat sensing cameras, skeptical security guys, college interns. The movie versions often have a very happy family. Almost spookily happy. The Conjuring is a very loud film. The beast that is wreaking havoc has a lot of anger. We find out early what’s going on. The rest of the film then becomes a procedural of how it is going to happen. How successful it is will be a matter of taste and how much your ears can handle. One interesting twist on the film, underused, but still effective, is the idea that the Warrens keep a museum of possessed artifacts in their home. The thing about it is these items aren’t trophies. They are things that contain demons, spirits and other malevolent forces. They tell their daughter to stay out of that room. I’ll give you one guess what happens when Grandma stays over to babysit. The family is headed by Ron Livingston and Lili Taylor. Livingston will always stand out to me as the guy who spent most of Office Space in a delightful trance. Seeing him as a concerned parent just makes me want to chuckle. Taylor, though, is the very essence of imbalance. Her face constantly evokes the wacked out Nell from The Haunting. The rest of the family is no more than faces without personalities. There is a girl who is torqued about moving into the house, but within the next couple of scenes, I can’t differentiate her from her siblings. Different kids have different hair, but her hair is matched by one other kid. That’s how hard it is to tell these characters apart. If I don’t know who they are, how can I care about them? As Ed and Lorraine, Wilson and Farmiga have an eerie presence that is forced to carry much of the film. If the rest of the characters are fleshed out a bit more, it might feel organic. As it is, it is alright, though not nearly scary enough for the possibilities. When given so little to work with, the film comes across as one of the re-enactment episodes on Paranormal State. This is not a bad film. Wan has requisite skill to match the film-goers demands of his time. If you want R-rated gore, like in the Saw movies, he gives it. If you want PG-13 thrills, you have them here. Nothing much that will linger with you, like that ball thrown off of the bridge in The Changeling. I am sure someone will remember the doll that knocks on the door. Just not me. Previous Post Pacific Rim: Where do you want to die?